During the Conference period (16 - 18 May) short trips will be organized. A minimum number of 10 persons is required. Please, give your name to the Registration desk, if interested. The Mozzarella farm, where you will get up close and personal with the main characters and enjoy very fresh dairy products such as mozzarella, ricotta, provola, yogurts, ice cream, etc. Plus you will visit a shop where exclusive leather product are produced. The Cilento Outlet Village is a citadel of shopping with pedestrian streets, which is home for numerous factory outlets of major Italian and international brands. The typical Mediterranean architecture and vast green spaces, a colorful children's play area, and many places to relax, make the Cilento Outlet Village a perfect place to spend your free time outdoors. 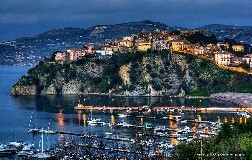 Agropoli, a sea side charming village. We will visit the old town and have a stroll along the shops and the bar to relax and chill in Italian style.